When I first released the book back in February, I had a plan for how to promote it. I knew what primary sources of traffic to my blog were, and I would reach out to those locations to get the word out. I somewhat naively imagined that word of mouth would spread from there. I was wrong. In the first month I saturated the market of friends, family, and people on the internet who already knew Ben's story. I'm not complaining at all. Those first month sales were strong enough to pay for all of the expenses I had incurred in actually preparing the book for publication, with a small amount extra that went right into Ben's Special Needs Trust. A lot of people had very nice things to say about the book, and on the whole it was a successful launch. After the first month, however, sales slowed to a trickle. Clearly I needed to do something more. The first "more" was to create a full Media Kit. I did my research, and then put together all of the items you can find now on my Media page: Press Release, Sell Sheet, Sample Interview, web-ready and print-ready cover images, etc. I did a small print run of some high quality copies of the Media Kit, and I began sending that out along with review copies of the book to media outlets. That is a long game that I am still waiting to see results from, but I will keep plugging away at it. 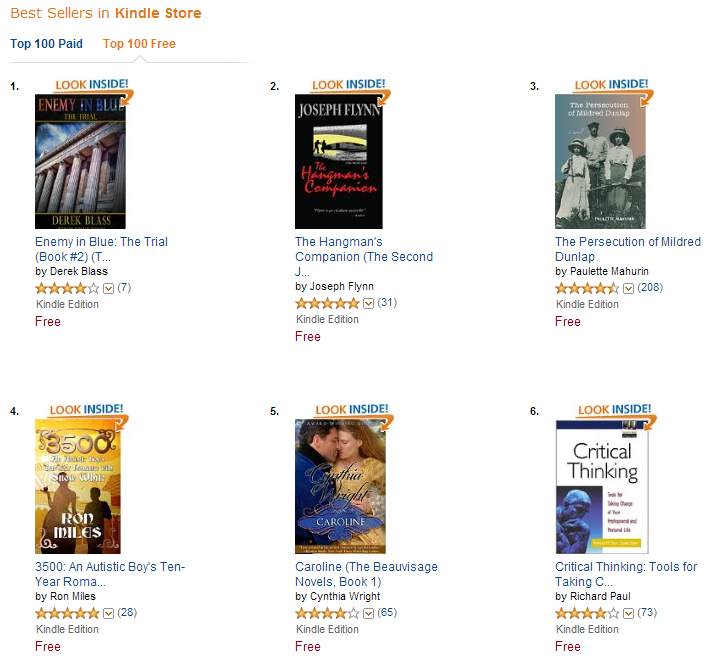 The next "more" was to plan my free Kindle edition promotion. The goal of the promotion was both to spread word-of-mouth about the book by getting it into more hands, and also to tweak the Amazon recommendation engine so that it would notice the book and start showing it to other readers. I hoped that I would be able to move 2-3,000 copies of the book, and perhaps just maybe I would squeeze into the top 100 chart for an hour or two. I did quite a bit of research on free e-book promotions and how to spread the word. In particular, I found this blog post by my friend Michael Montoure to be especially helpful. I wound up creating a spreadsheet and then listing every single website and newsletter I could find that announces e-book promotions. I meticulously went to each site and read through their submission requirements and identified how much lead time they required. Then I sorted the spreadsheet from longest lead time to shortest, and based on that I determined when to schedule my promotion. Some of the sites required as much as a 30 day lead, while others required the submission to be the day of the promotion. I Assigned dates on my calendar to remind myself when to submit my promotion requests to which sites, and then I was ready to go. The site that required the longest lead time was BookBub.com, and they were also the only one that required a substantial payment to advertise. Most of the rest were either free to submit to, or at the most had a nominal fee, but BookBub had a cost of over a hundred dollars. I thought long and hard about that one, and did some research on whether other authors felt like they got their money's worth out of BookBub. In the end I decided to go ahead and advertise with them, based on the fact that their daily newsletter goes out to nearly a quarter million subscribers plus the satisfied testimonials I found from other authors. BookBub is selective about which books they place on their newsletter, requiring the book to have some amount of acclaim, but fortunately by that point I had more than twenty reviews on Amazon with an average rating of 4.8 out of 5 stars. I submitted my advertising request to BookBub pointing out those reviews, and also giving them a link to Cory Doctorow's glowing review on BoingBoing. The next day I was very pleased to hear that BookBub had accepted my advertising request. Ultimately that single thing was the largest driver to the success of this promotion. Over the course of the next month I continued on with my schedule of announcing to the various websites, and as the day got closer I also began to tweet about my upcoming promotion. Finally last Thursday the book went on sale at 12am. I woke up that morning and saw that not only was I featured in the BookBub newsletter, but that I was the very top above-the-fold book. I had messages and emails from a few friends saying something along the lines of "hey, I saw your book on BookBub this morning!" I went to check the download stats, hoping that I was off to a good start with maybe a few hundred downloads, and I was hit with my first shock: by 9am Thursday morning the book had already been downloaded more than nine thousand times. I was floored. My second shock of the day came later than afternoon while I was out and about. 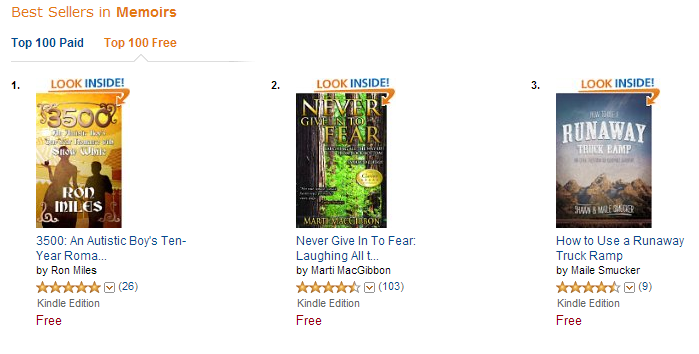 I got a message from a friend saying "did you know your book is #16 on the Amazon best-seller list?" Over the course of the next few hours I watched the book edge all the way up to the #4 position, as well as the #1 slot in Memoirs and in Non-Fiction. It held those positions well into the weekend. I took screenshots, which you will find at the bottom of this post, just so that I had photographic evidence of that time I was an Amazon Best-Seller. The past five days have been staggering, somehow both gratifying and humbling at the same time. I have received several very nice messages from complete strangers who discovered the book and loved it. The real question now is whether or not the success of the giveaway will translate into actual sales now that the promotion is over. I truly believe in this book, and I still believe that this is Benjamin's best chance to provide some kind of a nest egg for himself. I firmly believe that it could be a legitimate mainstream best-seller if I can just continue to grow the audience. I still have a long, hard slog ahead of me to promote the book, but now because of this past weekend I have another hook I can use to get people's attention. In a few weeks the original 90-day exclusive with Kindle will expire, and I will expand the book to Nook, iBooks, and Google Play. Later this week I will update the press release in my media kit to reflect how well the book has performed on Kindle. I have several new autism-related blogs to reach out to, and I will keep sending copies of the book and the media kit out to newspapers and television shows. I will keep joking about waiting for a call from Ellen or Oprah, but behind those jokes I will be doing everything I can possibly think of to actually make those calls happen. If you are reading this, and you enjoyed the book, by all means tell all of your friends. Send messages to your favorite talk shows and columnists and suggest they do a story on the book. Your support truly does mean the world to me. Thank you so very much. I finished the book today via the Amazon free promotion. At first, I was scared to read it, scared it would be like some books I avoid regarding autism....bitter memoirs, how I am a crappy autism parent because I do or do not do particular interventions, etc. I am so glad I did. I threw my head back and laughed, I cringed, I cried tears of both joy and disappointment for Ben and I instantly fell in love with him--because I feel I know him. Like my own blonde haired beautiful spectrumite boy, Ben's idiosyncracies were fodder for an emotional bond. It is obvious how loved your son is. I immediately ordered a copy to support Ben's trust. Soon, we too will be attempting to bring our son to Disney. He is almost five and for the past few years we contemplated whether or not our E-man could handle Disney world. We did our research and decided to try our luck. At the start of this year, we watched a Disney Vacation video. We talked about rides and his favorite characters and long lines. We gave him a Disney Jar he has loyally filled to several hundred dollars. And we set a time period--it will be his birthday month 2014. Hopefully, construction will be complete and I can tell him Ben's story as we ride the mine carts. I know I will certainly be thinking of him when we go! Ben's newest cheerleader, April T.
It's funny, when I was writing the book I made the conscious decision not to dwell on the more difficult aspects of raising an autistic child. I wanted to be open and honest, and give a glimpse into some of the hardships, but ultimately my goal was to present a fun, and funny, memoir about the *joys* of raising a child with special needs. I wanted the reader feel like they were right there with us cheering on Ben's victories; I expressly did NOT want the reader bogged down with "woe is me, my life is so hard" cheap theatrics. Because honestly: life is good. Ben is happy and healthy, and I am lucky to have such an amazing son. Thanks for this info. I'm researching now and this is helpful!